A true Georgian gem, this historic city still preserves all the charm of its 18th century past. Drawn in by the fascination of its Roman ruins, the beauty of its buildings, and the oasis of the new Thermae Spa, visitors come to Bath searching for culture, relaxation, and a quintessentially English experience. Thankfully, the charming tearooms of Bath provide the perfect answer, and here’s a list of seven you won’t want to miss. Enjoy your afternoon tea with all the style of an 18th century English lady in Bath’s Pump Rooms. Regarded as the social heart of Bath for centuries, this salon and ballroom still retains all the glory of its past. Sumptuous interiors, live classical music every day, and a fountain for guests to try Bath’s Spa water, celebrated throughout history for its healing properties. The Pump Rooms offer guests the most luxurious, and most authentically Georgian experience of afternoon tea in the world. Expect impeccable service and only the finest quality champagne. One of the world’s most well-known cafes, visitors flock here to taste the notorious Sally Lunn bun. Half-way between brioche and a bun, topped with a unique range of spreads, including coffee and walnut butter and the cafe’s special dulce de leche milk jam, the Sally Lunn bun is a true experience, and the secret recipe for this utterly unique bun is known by just five people. Located down a quaint side street in one of the oldest buildings in Bath, the city’s historic atmosphere penetrates every nook and cranny of this antique venue, with its different floors representing different time periods. 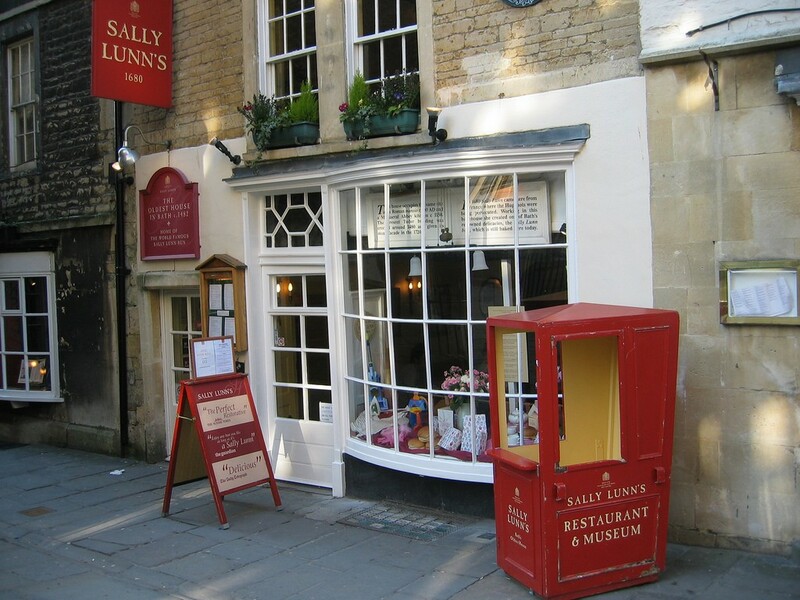 Dining at Sally Lunn’s also gives visitors the chance to enter the cafe’s museum for free to discover the history of the bakery and story of the renowned bun. Perfect for Austen lovers and history fanatics alike, this fascinating museum also boasts a charming tearoom. Continue the Jane Austen experience and take afternoon tea in true Georgian style in this historic town house, just a few doors down from where Austen used to live. With exquisitely presented food, impeccable service and perfectly brewed teas, this quintessentially English haunt is sure to be one you won’t be forgetting soon. The Regency Tea Room has been recognized by the Tea-Guild, who awarded the tea-shop an Award of Excellence; the Guild’s highest accolade. Delicacies and Mr. Darcy 🍰☕️ Jane Austen used to sleep in this room! Situated by the luscious Sydney Gardens and wonderful Holburn Museum, this cafe is an ideal stop-off during your cultural exploration of Bath. The care and precision that goes into every dessert here have made Indulgence a truly exemplary patisserie. The excellent quality of Indulgence’s cakes has been recognized in the Bath Good Food awards , where the cafe was named winner of the best local cakes award in 2013 and 2014. Its location, a short walk from the bustling main streets, mean that it has remained a local favorite and is known as one of Bath’s best kept secrets. The friendly staff and cozy atmosphere make Indulgence an ideal place to relax with friends. If the sweepingly magnificent Georgian architecture isn’t enough to bowl visitors over at The Royal Crescent Hotel, the panoramic view of the whole city from Bath’s landmark Royal Crescent will certainly do the trick. One of Bath’s classiest hotels, the Royal Crescent’s building is an exquisite example of 18th century architecture and the work of the famous John Wood the Younger. Nestled behind this Grade I listed building are the hotel’s tranquil gardens which stretch out for over an acre. Enjoy your afternoon tea in this oasis of calm. 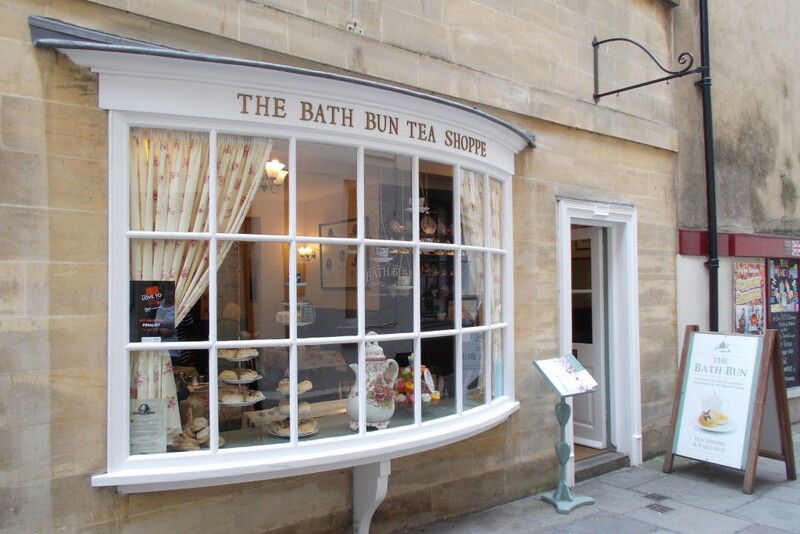 Conveniently located next to Bath’s Assembly Rooms and fashion museum, this tearoom is just a stone’s throw away from some of the city’s best sites and most breathtaking buildings. Wartime posters, dainty tea sets, and patterned table cloths all work together to create Bea’s Tearoom‘s enchantingly vintage atmosphere. Admire the retro clothing of the staff, peruse the wartime recipe books, and tap your foot to the contagious music as you enjoy a whole host of sweet delights. 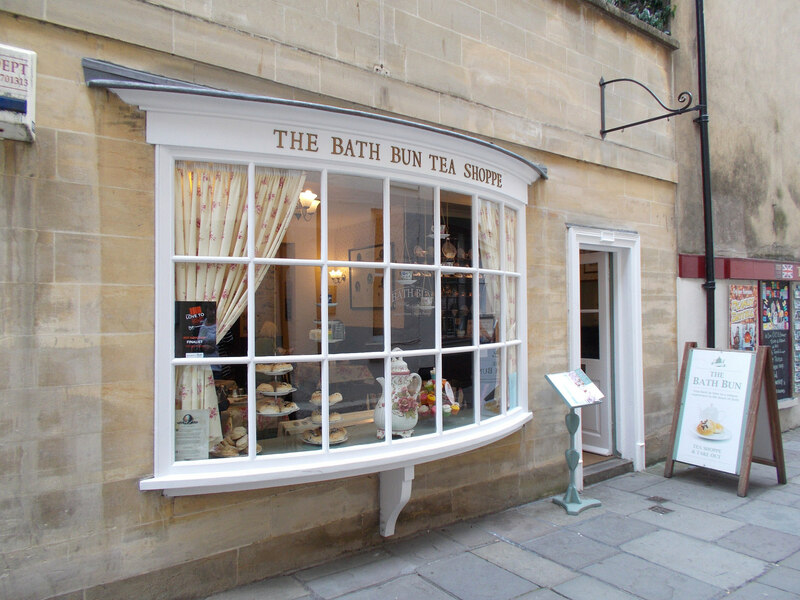 Set just behind Bath’s landmark abbey, The Bath Bun lies at the heart of the city’s buzzing center. It’s location behind the central streets and nestled in a tranquil square removes it from the hustle and bustle of the main shops and tourist traps. Outdoor tables allow diners to sit and relax under the luscious canopy of Abbey Green’s ancient trees and soak up the sight of the Bath Abbey. The old character of the teashop’s fabulous building, the waiters dressed up in true Georgian style, and the authentic taste of the Bath Bun blend to create a delightful afternoon tea experience.